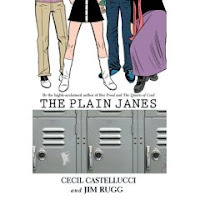 The Plain Janes by Cecil Castellucci and Jim Rugg. Copy: both an ARC from ALA Midwinter 07 and also a review copy supplied by the publisher, Minx. Graphic Novel. Jane narrowly escapes injury in a bomb attack in Metro City; her parents, wanting safety, move to the suburbs. Jane's questioning; Jane's not satisfied with life. She changes her hair from long and blond to short and black; and she uses the move to change the types of people she has as friends. Outsiders, instead of the popular kids. But she wants more. Needs more. Or so she starts P.L.A.I.N. On the one hand, Jane is like any other city girl forced to move to the 'burbs: "It'll be four years before I can get back to Metro City, where there are vibrant people. Culture. Life." On the other hand, while she doesn't realize it, she's using the move to keep people at a distance. She is also using the move to reinvent herself; when invited to the popular kids' table on the first day, she thinks, "I know this girl. I bet her name is Kim or Zoe or Cindy. I used to be this girl." Something different turns out sitting with three other girls who, Jane assumes, are "her type of people." Problem is, they don't welcome her with open arms. The three other girls are Jane (Theatre Jane), Jayne (Brain Jane), and Polly Jane (Sporty Jane). And it's funny, and a bit sad, how Jane expects the others to just welcome her and how she has to earn her way in. She doesn't just earn her way in; she creates a friendship between them all that didn't exist. Jane does it with the P.L.A.I.N. : People Loving Arts In Neighborhoods. See, Jane likes art; and she wants something more; and she's not a fan of the suburbs. Put it all together, and she's creating projects to bring art to the people, and to make them think. All done anonymously and quietly; a pile of stones sorted into a pyramid to protest new buildings, fireplugs decorated with hats and mittens, stuffed animals outside an animal shelter. The art: a book about the power of art has to be told with pictures, don't you think? Words couldn't describe the PLAIN projects. And with four girls named Ja(y)ne, the artwork also keeps these four as individuals. The panels project life, action, sadness, hope. About the only thing I didn't like is that the book ended on a bit of a cliff-hanger. But good news! A sequel is planned. I just wrote about this book last week, too! I felt the same way about the ending. It was very blah!